A report from CommSec’s chief economist, Craig James, explains how the latest Census data could help target NFP direct mail and fundraising campaigns for a much higher response rate, reducing wasted effort – and wasted dollars. According to Craig James, “the simple message is that if you are serious about planning and understanding your market, then the Census data is worth dissecting”. The Dataset results from the Census allow comparisons of results across states, regions and even postal codes. While more data is yet to be released, the current data shows where incomes are the highest, where the biggest grouping of “owner occupiers” is or even the male/female make-up of areas. “We can soon expect to be able to find out employment by industry in a particular area, and even how people travel to work,” James said. “The Census results offer an opportunity for Policymakers to demonstrate in coming months that they are actively using the Census results for a raft of economic and socio-economic purposes. Unlike other surveys, the Census covers the entire population and latest observations and changes over time are invaluable for policy planning and decisions. Before the mining boom it was a fairly easy exercise to determine the regions with highest incomes. The high income areas were generally found in northern or eastern Sydney and the inner suburbs of Melbourne. But now Western Australia dominates the regions of highest median personal income. Overall the top 13 regions for highest median personal income are in Western Australia. Not only do mining and energy regions dominate the lists of highest personal income and highest household income, but they are also regions of significant gender imbalance with males dominating industry employment. The postcode with the highest median personal income is 6710 – towns including Cane, Onslow and Peedamulla in Western Australia. The median weekly personal income of the 2,379 residents in the postal area was $2,000 or $104,000 a year. Not surprisingly other key mining regions featured in the highest income areas including Newman, Fortescue, Tom Price and Hamersley. 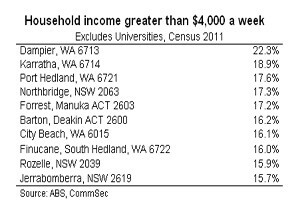 While the highest median personal income in Western Australia was $2,000 a week, in Tasmania the highest income was $749 a week in Cremorne, south-east of Hobart (461 residents). The postal area with the highest median personal weekly income in NSW was postcode 2061 covering Kirribilli and Milsons Point with the 5,680 residents earning $1,311 a week. In Victoria, East Melbourne (postcode 3002, 4,714 residents) has a median personal income of $1,164. The Sydney suburbs of Northbridge and Rozelle also are in the top 10 towns of households earning more than $4,000 a week. The 2011 Census revealed that there were almost 8.7 million private dwellings in Australia. Almost 7.8 million dwellings or 89.3 per cent were occupied but 934,471 dwellings or 10.7 per cent were unoccupied. The proportion of unoccupied dwellings has risen from 10.4 per cent in 2006 to 10.7 per cent in 2011. So if we have so many unoccupied homes, where are they? While the definitive break-down is not yet available on the reasons why so many homes are vacant, the primary reason is more than likely that they are used for holiday homes or holiday rentals or are properties available for rent. The highest number of unoccupied dwellings can be found on the NSW central coast and south coast, Victoria Mornington Peninsula, Queensland Gold Coast and Western Australian south coast near Mandurah. 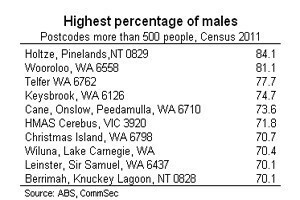 The highest concentration of males in a postal area (more than 500 people) is in the Northern Territory – postcode 0829, encompassing Holtze and Pinelands near Robertson Barracks. The ratio of males in the population of 1,137 is 84.1 per cent. As would be expected, areas with higher than normal concentrations of males in the population include military sites, prisons, and where male-dominated industries are located such as mining and energy areas. Areas with higher than normal concentrations of women are dominated by universities: Gatton College, Queensland (74.4 per cent), Charles Sturt University, NSW (64.3 per cent), Latrobe University, Victoria (60.4 per cent) and Macquarie University, NSW (56.3 per cent). But also high up on the list is Double Bay in Sydney where 56.3 per cent of the residents of the postal area are women. One interesting result that was produced from the Census was an increase in household size. Between 2006 and 2011 the number of people per household increased from 2.61 to 2.63 persons – the first increase ever reported in 100 years of Census results. As has traditionally been the case, remote towns with large indigenous populations in Western Australia, Northern Territory and Queensland dominate the rankings of household size. Burketown, Bathurst Island, Telfer, Binjari, Forrest (WA), Alice Springs and King Ash Bay are towns possessing highest household size. In capital cities, interestingly suburbs in western Sydney such as Cecil Hills, Bonnyrigg, Bossley Park and Hoxton Park have the highest household size with around 3.4-3.6 persons per household compared with the national average of 2.63 persons. In comparison, postal area 2011 including Potts Point and Rushcutters Bay in Sydney has an average household size of 1.6 people per home. The summary and attached report has been prepared without taking account of the objectives, financial situation or needs of any particular individual. For this reason, any individual should, before acting on the information in this report, consider the appropriateness of the information, having regard to the individual’s objectives, financial situation and needs and, if necessary, seek appropriate professional advice. In the case of certain securities Commonwealth Bank of Australia is or may be the only market maker.